Torres Del Paine National Park is located in the extreme south of Patagonian Chile. It’s a place surrounded by granite peaks, glaciers, glacier-fed lakes, snow-capped mountains, waterfalls and rivers, forests, meadows, fresh air and amazing natural scenery. Torres Del Paine translates to Towers of Paine in Spanish and is worldly recognised by the set of 3 peaks (2250, 2460 and 2500m), that can be seen on certain hiking routes in the park. 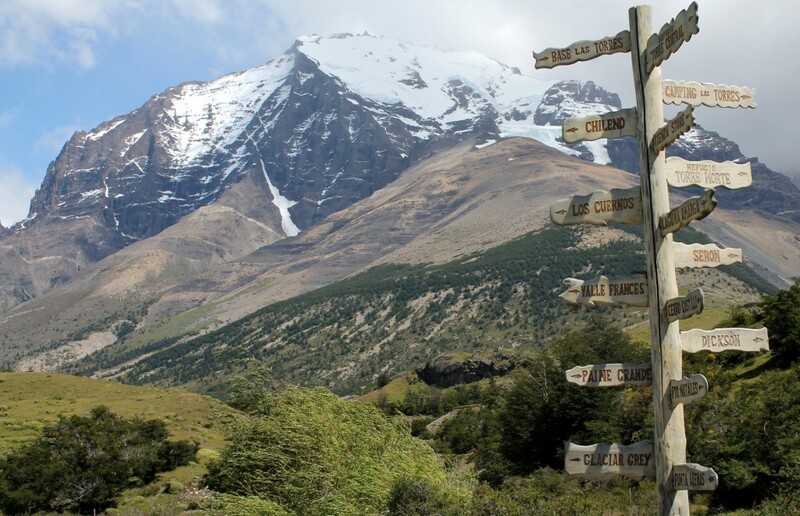 You will also see and hike by Monte Paine Grande (3.050m), Los Cuernos del Paine (2.600, 2.400, 2.200m), Fortaleza (2800m), and Escudo (2700m) on one side of the park and the Andes Mountain range on the other. There are a variety of hiking routes and accommodation options available. The most popular hiking circuit is the W-trek (which people typically hike in 4 or 5 days), the O-Trek (W-Trek + the back side of the park) which is the full circuit around the park that typically takes 9 days and the Q-Trek (O-Trek + the Tail) which is a slight extension to the O-Trek. Some people just do a day-trip visit of the park, but they don’t get to see the three towers. The weather in the park changes dramatically. You can experience snow, high winds, rain and sunshine in the same hour. The winds are particularly strong and certain trails on the park may be closed if it becomes too dangerous. In 2013 wind speed at 180 km/h was recorded in the park. In the second week of 2014 the wind had reached 120 km/h and as a result the trail to Mirador Torres was closed. I was in the park a week later and experienced wind up to 97 km/h. However, the wind is also responsible for the amazing scenery that changes so often and some interesting effects on the lake. You may see adverts from many tourist companies offering you tours of Torres Del Paine but honestly, it’s easy to do it on your own. If you are planning to stay in a refugio you can check for availability and book the refugios on the Fantastico Sur and Vertice Patagonia websites. All you need to then do is get yourself to Puerto Natales where you can book your bus tickets to the park, rent all the gear you need, buy snacks and meals for your trip, get all the advice you require from hostels, other travellers coming from or going to the park or at Base Camp (next to Erratic Rock Hostel) which gives a free 90 minute talk on trekking at Torres Del Paine every afternoon at 3 pm. 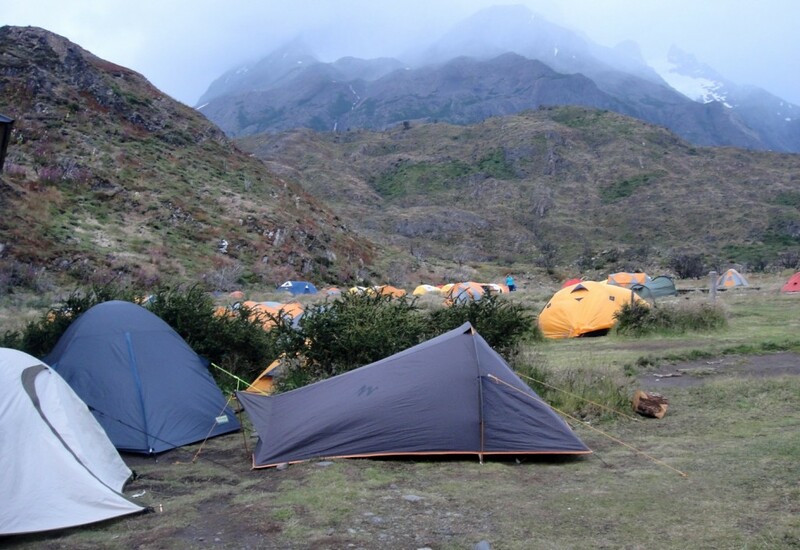 You can also meet up with other travellers to hike with at Base Camp. Unless you have booked a private transfer from Puerto Natales (Chile) or El Calafate (Argentina), you most likely will arrive at the park by bus from Puerto Natales. There are multiple bus companies offering trips to the park twice a day from Puerto Natales to the park – at 07:30 / 07:50am and 02:30pm (12000 to 15000 pesos for a return ticket). You can buy your tickets at the bus station or a hostel in Puerto Natales – and it’s not absolutely necessary to book in advance. You could buy a ticket on the day. It takes 2.5 hours to get from Puerto Natales to the entrance of the park (about 115km in distance) at Laguna Amarga. You will arrive at Laguna Amarga at approximately 10am to pay your park fee (18000 pesos), watch a video on the park rules, sign some documentation and receive a good map of the park. You have 3 internal transportation options available now depending on where you want to start your trek. At the Laguna Amarga park entrance you can take a shuttle to Hotel Las Torres / Refugio Torres Central / Refugio Torres Norte for 2400 pesos. This is recommended if you are hiking the W-Circuit from east to west. If you hike from East to West the sun is behind you but the wind is in your face and some of the good views are behind you. If you want to start your trek on the far side of the park (heading West to East) you get back onto the bus that brought you from Puerto Natales by 11am and continue onwards to Pudeto (on Lago Pahoe) where the catamaran is based. You should arrive at Pudeto by 11:30am. There is a catamaran that can take you across Lago Pahoe to Refugio Paine Grande (12000 pesos one-way and 19000 pesos return). This option is recommended if you are hiking the W-Circuit from West to East or if you are planning the O-Circuit. If you remain on the bus after Pudeto you can get off at Administration. From Administration it is a 5 hour trail to Refugio Paine Grande. This option is recommended if you are doing the Q-Circuit and want to start at the tail. Doing this tail section is only recommended when you are arriving into the park (you see Monte Paine Grande and Los Cuernos ahead of you growing larger as you head forward), not when you are leaving it. Between option 1 and 2 (if you are doing the W-Trek) and are planning to camp, it’s best to check the weather charts for the week (at the park entrance) and decide your route then (e.g. if it is clear day and you have a good chance of seeing the 3 peaks of Torres Del Paine on the day you arrive then start from the east). There are both free and paid for camping options available. Camping Torres (limited to one night), Paso and Italiano (which is an unofficial camping site) is free to camp at and has basic facilities (basically a long drop toilet and access to fresh water nearby). You are not permitted to camp outside these campsites. There are paid campsites available beside the refugios where you can use the showers. You are only permitted to cook in designated rain shelters within the campsites. No open fires are permitted anywhere in the park. 8000 Hectares of the park were burnt after one camper lit a fire in 2011 that got caught by the strong Patagonian winds and spread. There is paid accommodation available in a number of mountain huts in the park that are run by 2 companies, Fantastico Sur and Vertice Patagonia. You have to book your accommodation with them weeks or months in advance of high season through their website. They offer half and full boarding options, with bedding and tent options for rent (if you want to stay in the campsite outside). Refugio Torres Central, Torres Norte, Chileno and Los Cuernos are run by Fantastico Sur. Refugio Paine Grande and Grey are run by Vertice Patagonia. You really only need 2 sets of clothing – one set for trekking in the day and one dry set for the campsite / refugio to relax and sleep in. During the day I wore a water repellent trekking pants, long sleeved Dri-Fit shirt and added to this a fleece jacket and wind/rainproof jacket when necessary. I wore 2 sets of hiking socks and well worn hiking boots, a buff around my neck, a cap, sunglasses and sunblock lotion. At night I had a t-shirt, one long sleeved thermal vest, one track pants and dry socks. On top of these 2 sets you can add an extra pair of dry socks and a t-shirt, in addition to your underwear. I was able to wash and dry my day clothes in the refugio in the evening. I carried but had no need for waterproof pants or a swimming costume (unless you fancy taking a dip in freezing cold glacial lakes which I saw nobody do). Stay on the trail please. Don’t make your own trails or walk on an older trail that is currently under restoration. If you see a little stream across your path on the trail just walk through it. Face it – you are going to get wet. Don’t try tip-toeing on little rocks across – a huge unexpected gust of wind may catch you by surprise and drop you. Don’t use rain covers on your backpack. The high winds may blow it off. If it doesn’t blow it off it may act like a parachute that picks you off your feet and drops you. Instead, line the inside of your bag with a large plastic packet. Then wrap your items into smaller packets and place it into the large plastic packet. This will keep your items dry. Umbrellas and ponchos are a big no – they don’t work well with the strong wind. Carry trekking poles – at least one. It’s necessary to help keep you on your feet in the strong winds and helps relieve pressure of your knees. Respect the park rangers – they are there to help you. Don’t start open fires. Cook only under the rain shelters. Take lots of memory cards and spare batteries for your camera. The park is amazingly beautiful and you should take as many photos as you can with a decent camera. If the wind is too strong don’t challenge it. If people are injured or die in the park it is because the wind picks up stones and drops it on them, or because people wander of the trail into some unsafe region in bad weather. Stay on the trail. If it is too windy turn your back to the wind or lie down and wait for the strong wind to pass. Hi 🙂 i am going to Torres del paine but only have 3-4 days. Do you have a tecommendation for what i can do? I really want to see the 3 Towers and thats all i put on my have to see list.